For what reason? That's the least likely culprit. Every single IO pin has a voltage drop going towards one IO pin, which is the pin that takes in the row input for the function key. Flipping the leads results in an open circuit, which means that there is at least one diode in between this IO pin and all of the other IO pins. 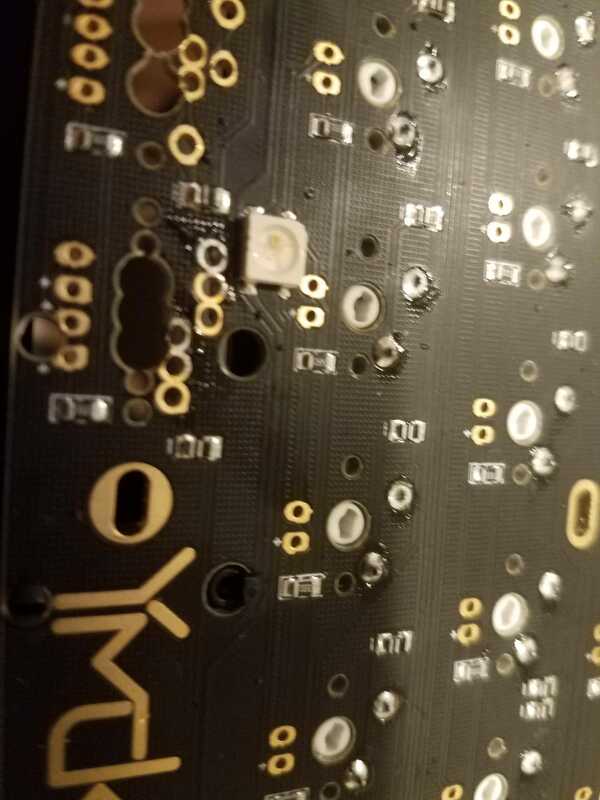 Unfortunately with switches soldered in I can only see half of the board, but there's no obvious defects that I can see, especially one that would cause this pin to get connected to every single other pin. I didn't completely mangle my board, which should be obvious from the picture, and there is no circuitry that I can find outside of the chip that could produce the results I see from my multimeter. I can think of reasons why this circuitry would exist inside of the chip however, and if the internal diode went bad and is now allowing bidirectional current that would explain everything. The only reason I'm hesitating is because I have very limited experience with smt soldering (my Iris was the first time I had ever done it). Well, that's annoying. I would offer to replace the 32u4 for you but shipping two ways may make it less appealing than just getting that new PCB that was offered. Glad you found the short. For the LED, I typically use either low-temperature solder or a hot-air reflow station. It's definitely going to be trickier without those. Did you use wick? Since the lead is busted anyway you can carefully lift each leg as you heat it, or get some low-melting-point solder. It's flush with the board and I can't find any legs to lift. Is it reasonable to suspect that some rosin may have wicked underneath and is acting as an adhesive? Just those pics I talked about earlier, nothing too crazy and nothing that's not fixable, just looks like it's been through the ringer. Just a heads up, yours looks exactly like mine did before removing the plastic film cover. Have you removed the weight and made sure you don't have the film there? Yea, I'm a grade A doofus. Took the film off and it looks great. @KaosJ-- You think there's a remote possibility of a R2 of these kits? I've emailed Vincent, but no reply. I'm sure he's busy with whatever new ventures he's tackling. I'll ask and see what he says, not sure how many people might be interested since R1 was already around 300 keebs. If there would be a R2 i would prefer something a bit different, don't you? Southpaw version! Numpad AND nav keys on the left side. I have the KLE and everything for it. I have yet to see a 96 left-handed but I think it would be the pinnacle of functionality for me. Sure! I think the kit's about as perfect as a 96 can get IMHO, but there's no such thing as a perfect keyboard. "Art can be defined as the perpetual pursuit of perfection which can never be obtained." Well i doubt, that's a total different design on everything. Depends on people interest, imho 1800 is more suitable for reversed pad. I was talking more about a 96 with a different case or something with better quality, e.g. pvd on brass, etc..